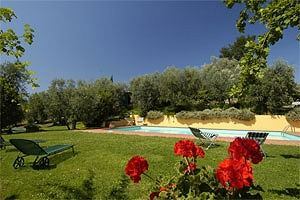 Luxury villa with swimming pool near Impruneta, on the hills surrounding Florence. 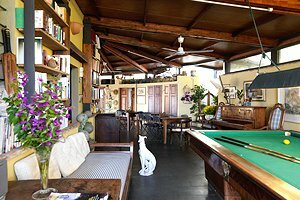 10/14 sleeping accommodations, billiard table, table-tennis table, Internet connection, air conditioning. 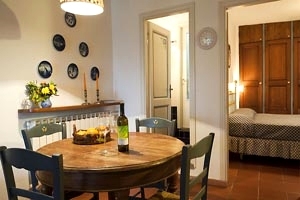 Situated in Impruneta, just a few kilometres from Florence, the villa (10/14 sleeping accommodations) is a typical Tuscan 16th-century farmhouse standing in panoramic position atop a hill and surrounded by a luxuriant olive grove. 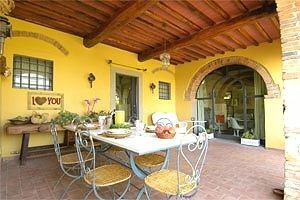 The villa has been recently renovated respecting the original style and structure. 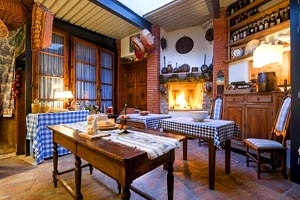 The complex includes the main villa (10 sleeping accommodations), two smaller apartments (both sleeping 2 guests) and a wide park with the swimming pool (6x12 m), a billiard and a table tennis table. 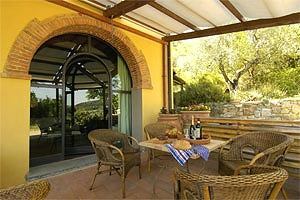 Every house has its own independent furnished garden where guests can have their meals al fresco. 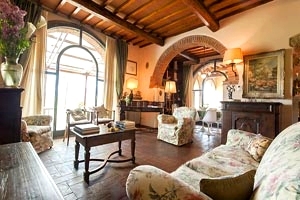 Situated near the A1 motorway and the Florence-Siena freeway, the villa is an excellent starting point for trips to Tuscany most important cities of art, such as Florence, Siena, Arezzo, Pistoia, Prato, Pisa and Lucca. 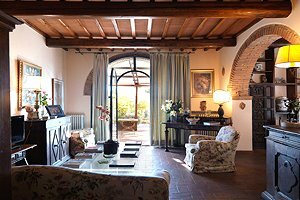 The main villa (5 double bedrooms and 5 bathrooms) spreads out over two floors and is completely independent from the other apartments. 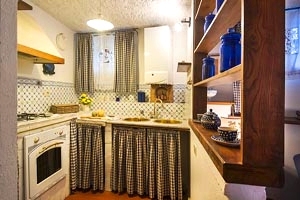 The ground floor composes of walled kitchen equipped with four-plate cooker, fridge, oven and dishwasher, dining room, living room with fireplace, small kitchenette and 1 double bedroom with en-suite bathroom with shower. 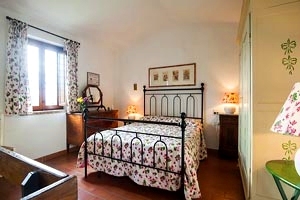 The first floor consists in 4 double bedrooms that may be converted into twin-bedded bedrooms. 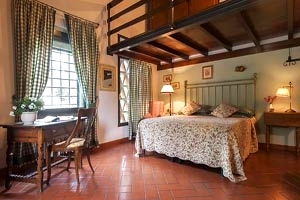 All bedrooms are provided with en-suite bathroom. 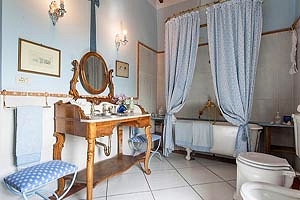 One bathroom is equipped with an old bathtub, two with shower and one with whirlpool bathtub. 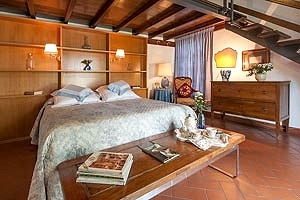 One of the bedrooms has external access to the one having the bathroom with Jacuzzi. 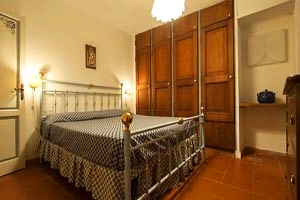 The bedrooms are provided with air conditioning. 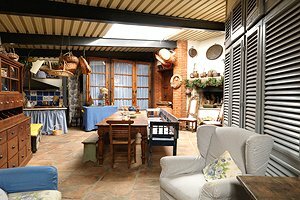 A porch furnished with table and chairs for eating al fresco and a veranda with billiard table and air conditioning complete the villa. 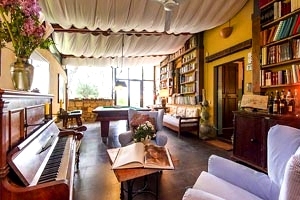 The villa is provided with swimming pool (6x12 m), table-tennis table, billiard table, Jacuzzi, Internet connection and air conditioning, washing machine, tumble dryer, iron and ironing board. 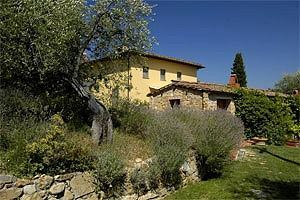 Shops and services of any kind are 1 kilometre from the villa. Florence 12 km - Prato 33 km - Pistoia 47 km - Siena 57 km - Arezzo 68 km - Lucca 78 km - Pisa 82 km - Livorno 92 km. 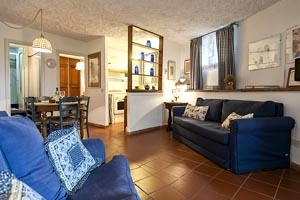 Florence airport 22 km - Pisa airport 83 km - Rome Fiumicino airport 295 km. 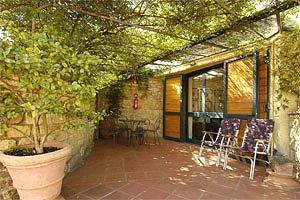 Pergola Apartment Apartment of 40 sqm (2 beds): living room with kitchen corner, double bedroom, bathroom with shower. 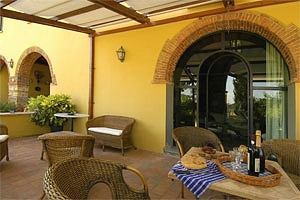 Private courtyard outside with kitchen corner. 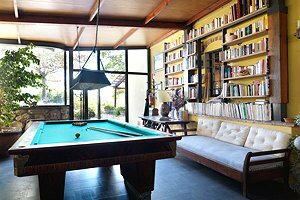 Use of swimming pool, tennis table, billiard, sat tv. 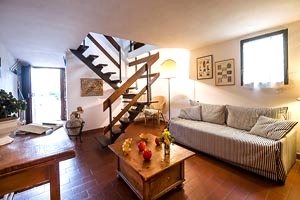 Meridiana Apartment Independent stone house (2 beds 60 sqm ) on two floors. 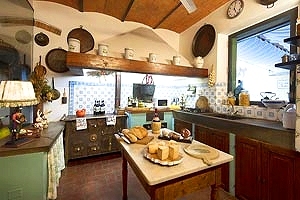 Ground floor: kitchen, lounge with fireplace. 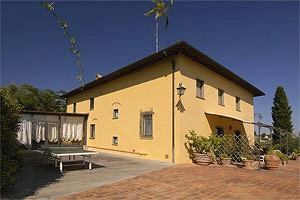 First floor: double with view over the meadow outside and bathroom with shower.